Is the Google Pixel 2 the best smartphone for the photographer in you? Shortly following its release, Dxomark called the Pixel 2 camera the “top-performing mobile device camera we’ve tested.” This blog post is an attempt to casually investigate this claim. As a social media photographer of sorts, I thought this headline was spot on. Beyond the ability to customize and edit how your photos look when shooting with the Pixel 2, Google offers another solution to one of the greatest challenges of on-the-go photography: storage. If you are the proud owner of a new Google Pixel 2 phone, then you also get to enjoy unlimited photo and video uploads in full resolution to Google Photos. This allows you to avoid taking up precious space on your phone and also provides an easily accessible web platform where the photos can be downloaded and shared. The photos are also backed up immediately without any additional effort once you reach a wifi/data connection. The Google Pixel 2 comes stock with a few different shooting modes to help you start capturing some more creative shots. 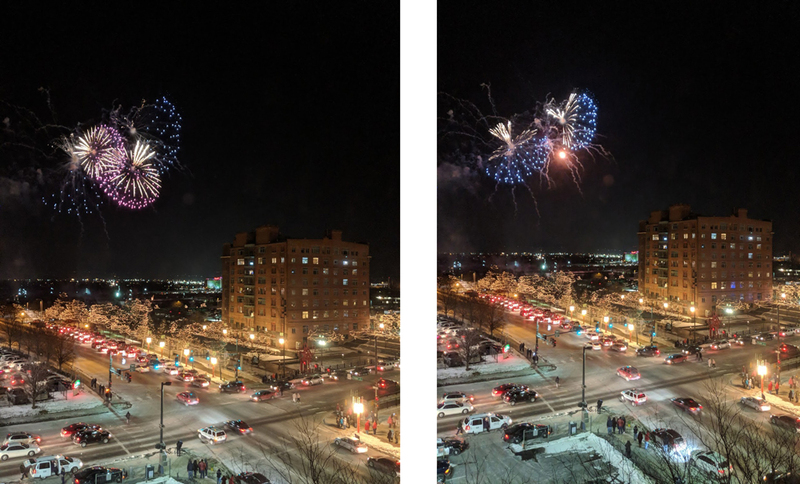 Here are two of my favorite shooting modes to use on the new Pixel 2 camera. I have never owned a camera phone where I actually looked forward to trying to shoot a panorama style photo, but the Pixel 2 makes it quick and easy. Here is a panoramic shot of downtown Omaha at sunrise with no editing or post-production effects. One of the most amazing features in the new Google Pixel 2 camera is a new shooting format called “portrait” mode. Portrait mode is a way to capture photos where the background is naturally blurred to enhance the clarity of the area of focus. This enables anyone to pull out their Google Pixel 2 phone and capture a super professional-looking profile style photo (think LinkedIn headshots) or product close-ups that can be used on your website and social media channels. Features like this democratize quality photography for the masses–and we are OK with that. Most of our clients care about the imagery used in their marketing enough to make it a priority in their budgets. However, for those that simply cannot afford the cost of a professional shoot with a photographer, features like this new “portrait” mode may provide enough of an edge to start shooting some original images without breaking the bank. If you follow the latest headlines in the world of Android phones, you may have heard about Google enabling the use of the Pixel Visual Core in popular photo-sharing apps and social media platforms like Snapchat, Facebook, and Instagram. The Visual Core taps into the HDR+ processing power of the Pixel 2 Camera to deliver the same quality images on in-app cameras as the main Google Camera app. In fact, the camera app actually boasts two HDR processing modes (HDR+ and HDR Enhanced). So what's the difference between HDR+ vs. HDR Enhanced? "Regular HDR+ takes a single exposure and applies powerful computational edits to improve the final product. Enhanced mode works more like a traditional HDR photo: It takes multiple exposures and merges them together, giving the phone additional image data to process. Enhanced mode can take some amazing snapshots, but it’s slower than HDR+. That means it’s unlikely to work well on moving subjects." This announcement is sure to satisfy Pixel 2 owners who have been using the phones since their release without this enabled. In fact, one of the first things I noticed about the quality of images I captured in Snapchat was that they did not match the quality of images taken in the normal camera app. This is no longer the case thanks to the Pixel Visual Core. Check out one of the photos I shared on SnapChat above (complete with my Bitmoji). The Google Pixel 2 camera is the best camera phone that I have ever owned for shooting night and low light photos. My old Android Moto X really doesn’t hold a flame to the technical specs of the Pixel 2 camera, but I am still absolutely blown away by the clarity and sharpness of photos taken without direct light. I decided to put this feature to the test in one of the most challenging shooting environments I could find: a fireworks display. As you can see from this image, the Pixel 2 camera had no trouble capturing amazingly clear images of these night scenes. When it came time to hit the record button, the Pixel 2 camera performed extremely well. I will admit, I spent more time evaluating the camera's ability to capture and process photos than I did with its ability to shoot and record video. But, this should not be interpreted as a sign that the Pixel 2 is lacking in any way when it comes to videography–I simply don't shoot as many videos as photos with my phone. The Google Pixel 2 camera can handle shooting in 4K (30fps), 1080p (30/60fps), 720p (30/60fps). It also features stabilization built-in which uses a combination of optical (OIS) and electronic (EIS) stabilization, plus post-processing, to keep shots smooth. After making the jump from my old Android Moto X to the Pixel 2, the most noticeable improvement in the quality of my videos was undoubtedly the audio. Perhaps my microphone was damaged on my old phone or simply never worked, but I always had trouble capturing a reasonable level of sound in noisy environments (like concerts). The Pixel 2 captures video/audio so clear and crispy that I actually find myself rewatching the videos after the fact. Take a look at this SnapChat video I captured during a show at the Down Under Lounge in Omaha. While the sharpness of this recording could improve with more light and a steadier (more sober) hand, the audio speaks for itself. This was also shot natively in SnapChat and probably compressed heavily for viewing/sharing on the new SnapMap. Many potential Pixel 2 customers are probably wondering, can I replace my high-end video camera with a smartphone for video? Without further testing, I think it is too early to tell for me. However, I look forward to capturing more video with this camera in the future and hope to revisit this question in a future blog post focused solely on video. This would not be a proper review of an Android phone if we didn’t comment on how it matches up with the iPhone competition across the aisle. Read a comprehensive review of the iPhone and the Google Pixel. Considering the fact that I have never used an iPhone, I cannot provide an honest answer. However, I can say that my friends who own iPhones are impressed for the first time with my Android device. Not only the quality of the photos it takes but also the additional features which make it so friendly to use (like storage).